Did you know that the biggest computers in the world are used to predict the weather? They measure their power in quadrillions of bytes – petabytes. Your home computer may have gigabytes of speed and maybe a terabyte of storage! As such weather forecasting can get extremely complex but here we will explain the very basics. The UK’s Met Office reckon that they can forecast five days ahead as accurately as they could 24 hours ahead, 20 years ago. Many people will remember how badly wrong the BBC Weatherman Michael Fish got the October 1987 storm the night before it exploded out of the Bay of Biscay and caused mayhem across the United Kingdom. He said it wouldn’t happen. Such inaccurate forecasting is unlikely to happen today. Generally the weather synopsis you will see on TV or hear on the radio up to 48 hours ahead will be very accurate while depending on the weather systems at play, you should only use the five day forecast as a rough guide. 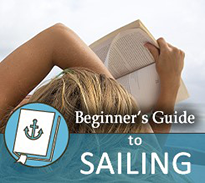 In short, while sailing you should always keep an eye on the weather even while in Greece. It is no good watching the five day forecast on BBC News 24 the night before you fly out and presuming it will be bang on – it could be very wrong and could lead you to make decisions that could put you and your crew in danger. Everyone has a smartphone these days! Kept charged they can be very useful for getting the weather forecast every day. The UK’s Met Office has an app, though Weather Online has a sailing app that gives you an accurate wind prediction every day across the Mediterranean, Ionian, and Aegean seas. 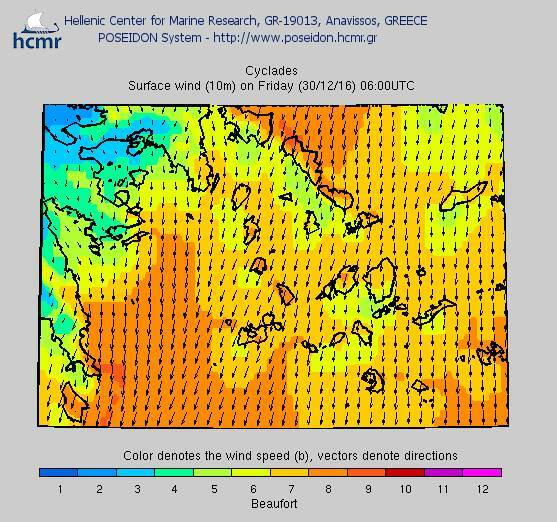 The Greek Coastguard will give you a 24 hour weather forecast on VHF Channel 16 on request. They will also broadcast gale and storm warnings in English on Channel 16. 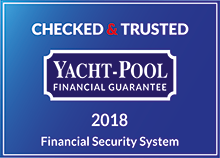 Olympia Radio (a telecommunications network that serves the needs of maritime security sector - tel: +30 210 6001799), gives hyper local weather broadcasts on VHF – that everyone can hear. Every boat has one, and they aren’t just there to look pretty. They will tell you the atmospheric pressure at that moment in time. If the pressure is falling quickly then there is bad weather coming in and you should start planning to get into port. Equally, if it is rising steadily it generally means that the winds are lightening and you will expect nicer weather to come. It isn't quite so simple! See the next section for explanation about rising and falling pressure. 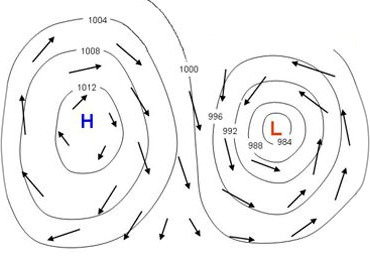 The high pressure (H) has winds passing around it that follow a clockwise route. You will see that the low pressure (L) area has winds passing anticlockwise. These pressure differences will reflect what you see on your barometer. Looking at the lines around them (called isobars) you will see that they can be close together or further apart. The isobars tell you the pressure difference across the area that they cover. Where there is a high pressure difference across that area, there will be lots of isobars, and this means there will be a lot of wind. You will often see lighter winds in a high pressure system and stronger winds in a low pressure system. Low pressure systems will move quickly across the Earth. High pressure systems tend to move very slowly. Low pressure systems will move around the highs and where they interact there will often be a fair bit of wind. More often within low pressure systems you get weather fronts. These are shown in a blue line with triangles and a red line with semicircles on it. Where the warm front comes in, there will often be light rain under stratus clouds and when this passes it should warm up for a while in the ‘warm sector’. Don’t relax too much – the fun has yet to come! When the cold front comes in you will see very high, dark clouds called cumulonimbus. The heat from the weather in front feeds them moisture and energy, and there will be very heavy rain and strong winds. This brings us down to predicting the weather from hour to hour. The barometer on the boat will give you one reading of the weather – it will tell you what the atmosphere is doing. The rest is done with your eyes and skin. During most of the high summer months you will see altostratus, the odd cumulus and cirrus (cirrocumulus) clouds high in the sky. If you see these on a big blue sky then you will have not much to worry about. Where you see larger puffy clouds such as the nimbostratus you can expect some wind and cooling rain. If the nimbostratus start coming together under a slate grey sky you may also feel the winds building – sometimes gusting from an unexpected direction. At this stage if you haven’t already it is wise to get a good weather forecast for the next few hours. Keep the wind strength in mind at all times. If it is building steadily and you may have to consider taking sail in, remember you’re not crew on the Volvo Ocean Race and don’t need to be out in weather that makes you uncomfortable. As the winds build and you get the feeling you’re going to be out of your comfort zone, start heading for a good anchorage or marina. Sometimes during a hot, humid day the atmosphere may develop cumulonimbus clouds. These produce thunder and lightning as well as violent winds and sometimes hail. Lightning is particularly attracted to metal things sticking out of the sea such as yacht masts! It doesn’t happen often but you really don’t want to be hit as it will fry all your electrics, including VHF, and possibly prevent you from starting your engine. The best place to be in this weather is in the marina!